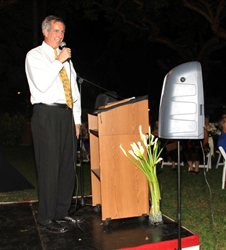 Each year, the Florida Keys Lodging Association recognizes a General Manager for Key West, the Lower Keys, and Upper Keys that has done a particularly outstanding job. The recipient should demonstrate exceptional qualities in overseeing his or her property, has inspired staff to high levels of guest service and who has always managed to maintain the composure and grace that is the hallmark of a first class manager. As the last President of the Key West Hotel & Motel Association, with 25 years in managing the Southernmost Hotel Collection, Matt Babich knows hospitality. This year he was named Key West General Manager of the Year for the second time in his career, and is the only General Manager to do so. The award winning Southernmost Hotel Collection is an elegant group of four unique hotels in historic Old Town Key West, where Duval Street meets the Atlantic Ocean. Southernmost Hotel in the USA, recently renovated in 2012 with all new guest rooms, sits on the quieter side of Duval Street and is within walking distance to many restaurants, shops and is across the street from the beach. Southernmost on the Beach offers a front row seat to the Atlantic Ocean’s sunrises and winter sunsets. And, The La Mer Hotel and Dewey House are the only beach front Victorian bed and breakfasts in Key West, Florida. With your choice of 3 pools, 2 beaches – one private and one public, 2 pool bars, an oceanfront bar, The Southernmost Beach Café oceanfront restaurant for dining, a petite spa and many on-property activities, The Southernmost Hotel Collection offers something for everyone. To learn more about the Southernmost Hotel Collection, 1319 Duval Street, Key West, FL 33040, visit the website at http://www.southernmostresorts.com.